Welcome to the Izaak Walton Inn & Resort, a family-owned retreat bordering Glacier National Park, in Essex, Montana. Specializing in outdoor adventure and serious relaxation, the Inn hosts activities year round fitting any age, interest and experience level including cross country skiing and guided back country tours, hiking, horse back riding, white water rafting to slow float and larger boat excursions. No matter what time of year you choose to visit, what pace you'll set your journey to, enjoy the nature, the history, and the hospitality found at the Izaak Walton Inn. Relaxation is key in the quiet rooms where TVs and room telephones are absent and beds are extra plush. 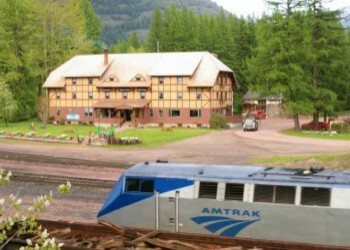 The main, historic lodge and fully equipped, authentic caboose cars in the hills all house d�cor reflecting the Inn's historic past, surrounding nature and laid-back Montana style. 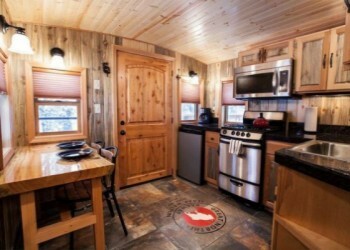 Our ski-in &out cabins offer private lodging right on the trail system with all the other lodge amenities. Twin porch swings hint at the Inn's slower pace and no-rush dining in The Dining Car & our new heated covered patio , affords guests the chance to take a break from the trails & have a hot beverage & local specialties while taking in stunning mountain views, fresh air, and the occasional passing train. 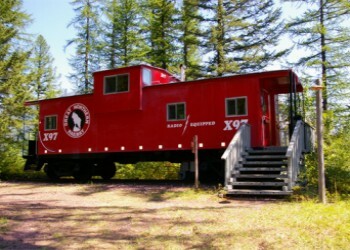 Cabooses are appointed with a bathroom with shower, kitchen, & a deck with chairs and a propane grill overlooking the tracks with spectacular views. Perfect for ski-in/ski-out winter fun and woodsy summer relaxation. 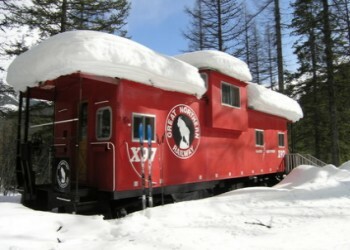 There is a two night minimum for all caboose rentals. Rates for cabooses are based on double occupancy, plus tax. Family cabin rates are based on 2-3 adults plus children. Room rates include use of the sauna, hot tub, ski, or hiking trails.